Building regulations, set in place by bodies such as the South African Bureau of Standards (SABS) after extensive research and consultation with industry experts, consider all aspects of a given building material’s composition and properties to ensure that it meets the same safety and performance standard as any other building material in the same application. Typical fire break between two flats or town house units. • Each independent dwelling unit situated on either side of a fire wall must have its own bracing system within its roof structure, regardless of the fire wall projecting above the roof covering or not. 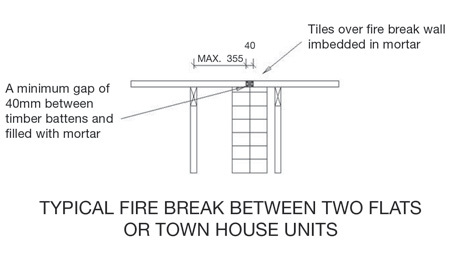 • The fire regulations do not state the size of a permissible gap between timber members bearing on either side of the fire wall. 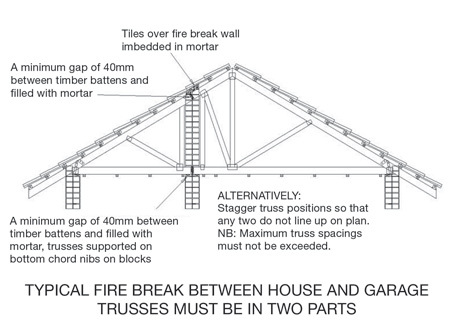 However, trusses passing through a fire wall must be split into separate trusses. • No tile underlay or insulation may pass over the fire wall. "Fire walls, where required, shall be carried up tightly against the underside of the floor except that combustible minor structural members, such as battens, to which roofing material is directly fastened, may be permitted. Purlins must not penetrate a fire wall for a distance greater than 80 mm, but if they penetrate from both sides of the wall, at least 80 mm of non-combustible material must separate them." Typical fire break between house and garage; trusses must be in two parts. While the Institute for Timber Construction South Africa (ITC-SA) does not make the regulations governing timber construction in South Africa, as part of its endeavours to promote and protect the industry, its players and the general public, it interprets and disseminates them. It is the responsibility of all players, from the manufacture to erection and inspection of timber roof trusses to enforce the regulations; even engineers who sign off on a non-compliant roof structure could well be put to task by the Engineering Council of South Africa (ECSA). 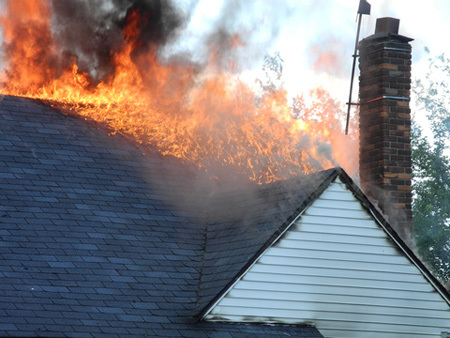 Professor Walter Burdzik of the Department of Civil Engineering at the University of Pretoria confirms, "Any failure of a truss plant or roof inspector to insist on the separation of roofs per fire regulations needs to be reported to the ITC-SA. The same principle applies to low-cost housing; just because a roof is over a low-cost house does not justify deviating from National Building Regulations." Fire Security; A Guide to Architects. Department of Public Works. Revised: January 1998. http://www.publicworks.gov.za/PDFs/consultants_docs/FPOG613E1998.PDF Accessed: 24 May 2017.